While most of the fights around locking down access to the internet has focused on whether telecommunication vendors will be giving preferential treatment to certain partners, a new threat has emerged far away from the telecommunication industry. As access to the Internet increasingly moves away from the PC and to mobile devices, it appears that the new model of interaction with devices can now provide multiple points of lockdowns when it comes to the Internet. This is the area people have been most worried about. 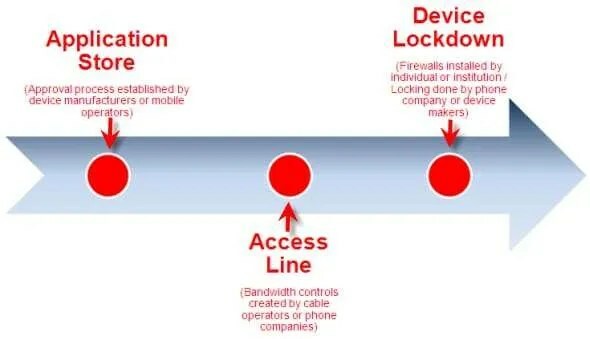 In this scenario, cable or phone companies can impose certain levels of control over what traffic is and isn’t allowed to access devices that are connected to those lines. For example, a couple years ago, Comcast discriminated against bitorrent traffic without its users. The FCC later ruled such discrimination to be illegal. The telecom and cable industry usually argue about the necessity of such discrimination as a mean of ensuring that all their users are being serviced properly. Opponents of such approaches, myself included, argue that the internet was created as an open medium and ought to be kept as such. Traditionally, mobile devices have been largely locked down by the carriers, who controlled the experience from end to end, dictating what could and couldn’t go on the phone and how it could be used. In the United States, the lockdown even goes as far as tying mobile phones to particular networks. It is customary for mobile devices to be locked to the mobile provider servicing it (even in the case of GSM, the devices are locked to particular carriers). For a brief period, Apple seemed to wrestle control away from the operators: with the introduction of the iPhone, Apple created an opportunity to wrestle away control of “the deck”, meaning the set of applications installed on a phone. With the success of its devices, the rest of the industry followed and it is now pretty commonplace for any modern smartphone vendor to have the opportunity to let device users decide what software is installed on their phones. Application stores are the newest point of control for access to a lot of Internet functionality. In the case of Apple, that control manifests itself through the method the company applies to deciding what is acceptable or not, when it comes to the app store. The reason I’ve been writing a lot about Apple’s point of control is that, if history serves, what Apple does generally has a wider impact as its competitors seem to follow what it does. As a thought leader, the company thus has a different level of responsibility to its industry (in a way, Apple is in a position not dissimilar to Microsoft in the late 90s (with Windows), Google in the last decade (with its search engine), and probably Facebook in the future (with its social graph)). On one hand, application store owners may argue that they are filtering content to ensure that their user community get the best experience possible. The argument may hold some water but, unfortunately, it is not dissimilar from the idea cable and telco operators presented when they started to discriminate traffic on their networks. On the other hand, completely open stores more closely resemble the internet, a place where the creation of individuals sits next to that of corporations, and where some pages may offend while others enlighten. In such an environment, the fight to keep censorship off the internet becomes more diffuse and more difficult to manage. If we are to build (and I still believe that we are in the early days of the internet) a new medium that remains as the most democratic delivery method for all of human’s expression, we need to be fight back when anyone tries to lock the net down. Over a decade ago, the US Supreme Court ensured that the US government could not censor what is on the Internet: it is now OUR responsibility to ensure that other parties are not given that control.